A month ago we spotted the Klipsch Promedia 2.1 speaker system selling for $110, which is $40 cheaper than what Amazon and Newegg sell it for. If you missed out on that deal and have regretted it ever since, now is your chance to take a mulligan. BuyDig once again is offering an old favorite at a tantalizing discount, this time without a coupon code and through eBay. Shipping is free in the U.S. These are listed as brand new speaker systems, not refurbished, with a 1-year warranty. The only caveat, if you want to call it that, is they're not the newer Bluetooth version that Klipsch sells for $199. 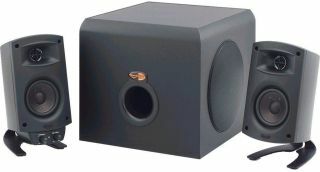 This is one of the most popular multimedia speaker sets and is generally well regarded by those who have listened to them. It's not quite audiophile quality, but for the money, the audio is very good with enough bass to piss off the neighbors. We don't know how many of these BuyDig has available at this price, but at time of this writing, it had sold 110 of them. If you're interested in buying one, go here.